"Troed y Rhiw " meaning "Foot of the Hill" source Google Translate. The Gate House Hotel opposite it's twin, the Cwmbwrla Inn. 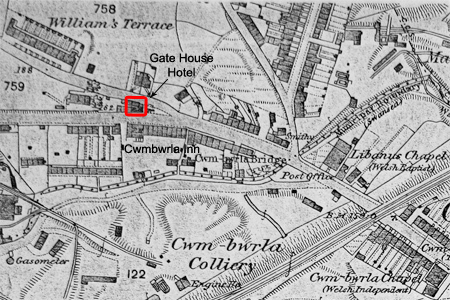 Reproduced from the (1879) Ordnance Survey map, without reference to the Gate House Hotel and also Cwmbwrla Inn. (C) D11 TRANSPORT, ROADS, TURNPIKES 1859 Aug.12 Glam.Roads Board:Footpathson on Turnpike Road, Plymouth Gate to Troedyrhiw.P5. (WGA) N/A N/A 1864 Sept. 27 The Inn was first licenced under the name Troed y Rhiw Inn on the, with the ground rent at £1 10s, the name means foot of the hill in Welsh. (C) H34 BUILDINGS, COMMERCIAL BUILDING, INNS, PUBLIC HOUSES, HOTELS, SOCIAL CLUBS 1869 Sept.17 Death of WM.Jones at Voss & Co.Tinplate Works Cwmbwrla.Inquest at Troedyrhiw Inn.P5. (LIC) N/A N/A 1875 Elias Thomas was the Landlord. N/A N/A 1875 Dec. The Inn and the attached cottages were put up for sale. 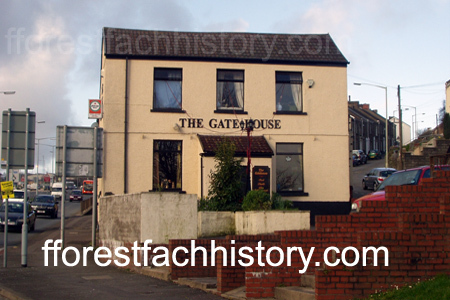 (WGA) N/A N/A N/A Around this time the name changed from the Troedyrhiw Inn to the Gate House Inn, named after the of the old tollgate house that stood outside the Inn. (LIC) N/A N/A 1889 Jenkin Henry Evans was the landlord. (LIC) N/A N/A 1905 Swansea Old Brewery was the owners. (LIC) N/A N/A 1905 James Evans was the landlord. (LIC) N/A N/A 1907 Richard Felix was the licence holder. (LIC) N/A N/A 1908 Ryan Felix was the licence holder. (LIC) N/A N/A 1909 Margaret Ellen Ryan Felix was the licence holder. (LIC) N/A N/A 1911 Edward Richards was the landlord. (LIC) N/A N/A 1920 Anne Richards was the landlady. (LIC) N/A N/A 1930 Lawrence Hoare was the licence holder. (LIC) N/A N/A 1940 Nov. Mary Ann Hoare was the licence holder. (LIC) N/A N/A 1941 July. William Haydon Deane was the licence holder. (LIC) N/A N/A 1946 Apr. Walter George Clist was the licence holder. (LIC) N/A N/A 1958 Oct. Florence May Clist was the licence holder. (LIC) N/A N/A 1958 Nov. Alexander Watson was the licence holder and still was in 1962. (WGA) N/A N/A 1972 Alterations were carried out to allow for the widening of Middle Road. "Middle Road consisted of one terrace of houses and between Carmarthen Road and Middle Road at the point of intersection stood the Gate House Hotel and facing it on the opposite side the Cwmbwrla Inn was built." N.L. Thomas, Swansea District and Villages - Cwmbwrla p.7, printed 1969.